Performing at-home teeth whitening is a great way to keep your teeth looking their best throughout the year. While whitening at home is more convenient, you’ll need to be extra careful as well. Teeth that have just undergone whitening treatment are actually more susceptible to staining, so you’ll need to stay diligent about your diet. Consuming food or beverages that are known for staining or being highly acidic can damage your investment, so let’s discuss the food and beverages to consume and avoid after teeth whitening in Cocoa Beach. 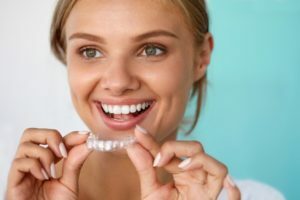 If you plan on getting multiple cosmetic dental treatments, make sure that teeth whitening is one of the first treatments you do. Patients who have cosmetic restorations already, such as porcelain veneers, will need to get them replaced. This is because the shade they were produced to have will no longer match your natural teeth. It’s also because porcelain doesn’t respond to teeth whitening. Additionally, touchups are just a normal part of keeping your teeth white, so depending on the foods you eat, you may need to get touchups more often. As a rule of thumb, consider touching up your smile every few years after undergoing your first whitening treatment. Let’s start with foods to avoid right after whitening and why they can damage your results. Red Meat – Not only does red meat contain staining properties from it’s color, but it’s also naturally acidic. Pickles – This goes for all foods pickled in vinegar, a very acidic ingredient. Whether it’s pickled carrots, onions, or any other vegetable, avoid it at all costs to avoid tooth sensitivity and damaged enamel. Fruit – Most fruits contain acidic properties, so avoid them to prevent irritation and sensitivity. This is especially true for dark berries which also contain staining properties, such as blueberries, blackberries, cranberries, strawberries etc. Dark or Richly Pigmented Foods – Tomato sauce, mustard, dark marinades, leafy greens, chili, soy sauce, and any other richly colored foods should be avoided. Coffee, Dark Tea, Red Wine, and Cola – These beverages all contain acidic and staining properties, so avoid them for the first few days after whitening. Before eating or drinking, ask yourself if what you’re consuming can stain clothing. If the answer is yes, it can easily stain teeth. As long as you make the effort to avoid harmful foods during your at-home whitening treatment, you’ll have a brighter smile for many years. Schedule an appointment with your cosmetic dentist in Cocoa Beach to get started improving your smile’s appearance today! Dr. Gary C. Nawrocki eared his dental degree from the University of Florida and since then has studied cosmetic dentistry at Louisiana State’s Dental School. To learn more about his at-home whitening treatments, contact him through his website.